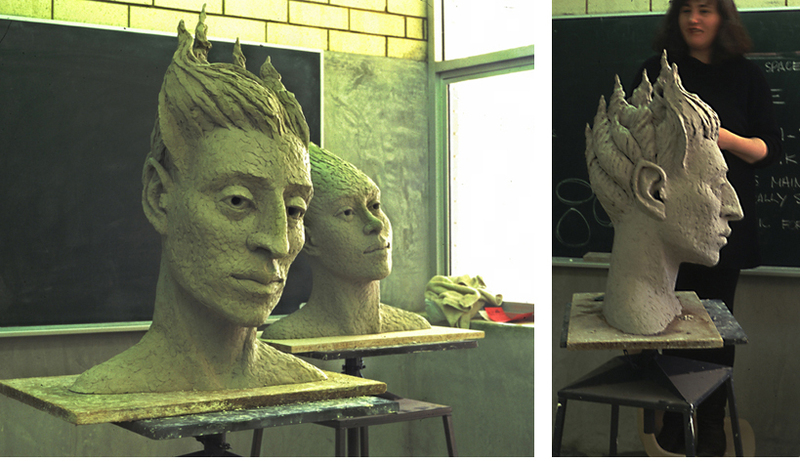 Diane was artist in Residence at Midland Tafe near Perth, Western Australia, whilst Phil was working on the Forest Phoenix Fire Sculpture Project. Based in the Ceramics Department run by Anne Cruse, the arts and access students were encouraged to chat to Diane and watch her working during the residency. Anne had suggested the use of paperclay for her residency project. The heads were glazed and fired after we Australia. We also gave a lecture about our public art projects to the students - a new Environmental Art Course had recently been set up at the college, run by Peter Dailey. These students made large sculptural lanterns under Diane's guidance for the Forest Phoenix project.